If you are an educator, a student or someone who loves to read, it is time for you to understand what an e-book reader is and how it will affect the future of your work and pleasure. 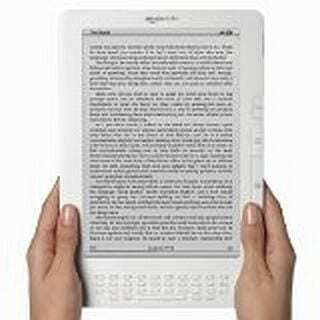 Kindle is a new product which is a book reader device. If you love the mobility and feel of a true book then you should buy a kindle reading device. With the kindle you read books via a 6 inch (or 9.7 for the DX) display screen on the device. It is a hardware and software platform for reading e-books and other digital media. Kindle sets to change the way of reading books, web logs newspapers, and more. The most interesting component is its paper-like display. Kindle is very challenging to the greatest threat facing LCD displays in laptops. It has three hardware devices known as kindle, kindle2 and kindle DX. Kindle use a cellular data network to deliver books, magazines, newspapers, and web logs to you instantly. It is very small, smaller than the paperback books also. It just weighs 10 ounces and has a 6 inch diagonal screen. The DX has a 9.7 inch screen ans weighs 19 ounces. It has a full QWERTY keyboard. It has a long battery life. You can use it for 30 hours without any interruption. And can be recharged in just two hours. It has a good storage capacity. Depending on the model, it can hold anywhere from 200 to 3,500 books at a time. It has a pleasing screen for reading and very easy to look at formatting. It also has EVDO network to browse. You can easily access to Wikipedia and The New Oxford American Dictionary. It has wireless connection. The books are downloaded from the kindle store through sprint’s EV-DO network. You need not pay for the wireless connection as the bill of the books includes that. You can buy Amazon books anywhere, where the cell is available. It also has search capabilities. The books are very cheap $9.99 only. It is easy to use the screen, with large side buttons which you can move forward and backward. It is a long term saving. It is pretty much no real direct publisher/author support. More profits go to the author. The design is not that good it looks as an asymmetrical tablet which has big buttons and a keyboard. Not small enough to fit in a pocket. The price of the kindle device is still high. The first Kindle costs about $399. Recently the price dropped to $299. If you are interested in this model, now is the time to buy it. The DX is $489. It does not have a color display and has a black and white display. It gets frustrating when you are reading magazines or newspapers. With all the pros and cons, so far the Kindle is a sold-out product, according to Amazon’s website. Sony also has a e-book reader. Not has popular as the Kindle, only holds 350 books and has no wireless capability. But it supports Word and PDF documents. Touchscreen allows you to turn a page by swiping a finger. Cost is $350.